Patrick Shea of the University of Maine celebrates a goal during a recent game against Colorado College. 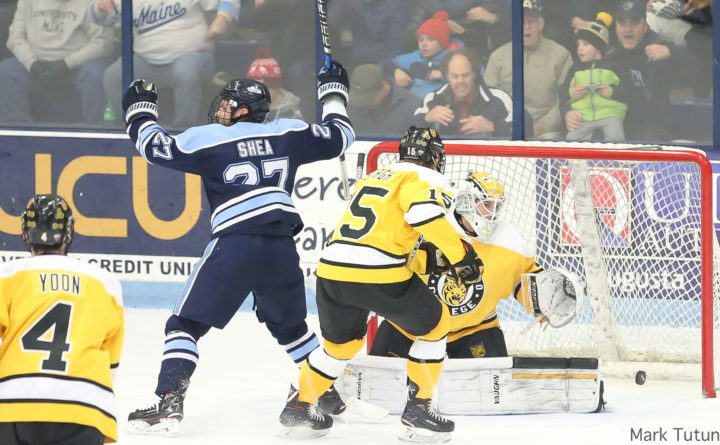 The Black Bears open a critical stretch of Hockey East games with a two-game series against Northeastern starting Friday night at Alfond Arena in Orono. With its 10 nonconference games in the rearview mirror, the University of Maine men’s hockey team begins a stretch of 16 Hockey East games with a home series against surprising Northeastern University at Alfond Arena. The 12-4-1 Huskies (6-2-1 HE) and the 7-9-2 Black Bears (3-3-2) play at 7:30 p.m. Friday night and at 7 p.m. Saturday. This season, only the top eight in the 11-team league qualify for the postseason, and the top four earn home ice for best-of-three quarterfinal series. All 11 teams qualified last season and the top five earned first-round byes. Six of UMaine’s eight league games have been on the road, but seventh-place UMaine will play 10 of its final 16 games of the season at Alfond Arena. UMaine won its past two games, scoring 4-2 over Colorado College in Orono and 4-3 in overtime over Yale at the Cross Insurance Arena in Portland. Freshman defenseman Jakub Sirota from the Czech Republic (6-foot-2, 190 pounds) made his debut against Yale and impressed head coach Red Gendron. “He started the game off as our seventh defenseman, and when the game was over he was in our top six,” Gendron said. “The more he played, the more confidence I had in him. The Northeastern series begins a string of five games in a six-game span against three of the teams atop the standings. The Huskies are tied for third. UMaine then visits Hockey East co-leader Boston College (6-1-2) on Jan. 16. After a rare home matinee against New Hampshire on Martin Luther King Jr. day (Jan. 21), UMaine entertains co-leader Massachusetts (7-1) on Jan. 25 and 26. “Our fate is in our own hands,” said Gendron, whose team has scored eight goals in the past two games after mustering only 10 in the previous six contests. UMaine scored three power-play goals in eight chances over its past three games after going five games without a man-advantage goal (0-for-16). The Black Bears have killed off 23 of the past 25 opponent power plays.